While there are the obvious job scams, there are always new ones to watch out for. Job scams are unfortunately a part of the job search process. And it seems that if you’re in the market for a work-from-home job, you’ll find weeding out the scams from the legitimate, professional-level jobs even more difficult. While there are the obvious job scams, there are always new ones to watch out for. After months of hoping (and praying), you finally spot a work-from-home job with a company that you’ve been dying to work for. Since it’s a large, well-known company, you don’t blink an eye before submitting your job application. But are you sure that it’s really the company’s website that you think it is? Job scammers have gotten super savvy at making copycat websites. So double-check the URL to make sure that you’re on the real site (e.g., there may be a misspelling of the company’s name, or the URL may end in .net when it should be .com). If you’re still unsure, go to the real company’s website through a Google search and try to locate the same position, and apply via the correct site. It can feel like Christmas has come early when a potential hiring manager contacts you directly for a job interview! He tells you that he found your info online (maybe through LinkedIn or your professional Facebook page) and wants to hire you for a job that hasn’t been posted yet. Even though it’s a huge boost to your ego when someone reaches out on their own to interview or hire you, red flags (not sugar plums) should be dancing around your head. Luckily, this has a quick and easy fix. Suggest another time to do the interview, and in between, contact the company to confirm that this individual actually works for the organization. Even better, make sure that this job posting actually exists as well. That way, you’ll know if you’re dealing with a staffer from the organization—or a scammer. Not giving personal information to a potential boss is the Big Red Flag of job scams, but still, some eager job seekers continue to do this every day. Why? The scammers are slick about how they get your personal information from you. For example, they will use Fortune 500 company names (such as Google) and their logos, and fancy-sounding programs designed to get your bank account info—and separate you from your money. It still goes without saying: you should never have to pay to be hired for a job, no matter what the hiring manager claims the terms may be. 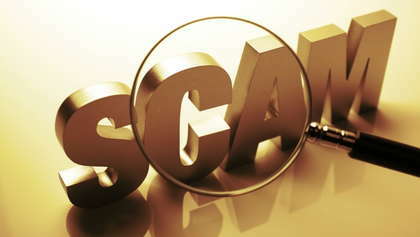 Job scams may never go away, but that doesn’t mean you have to fall prey to them. The best way to avoid a scam is to listen to your instincts and remember, if a work-from-home job seems too good to be true, it probably is.